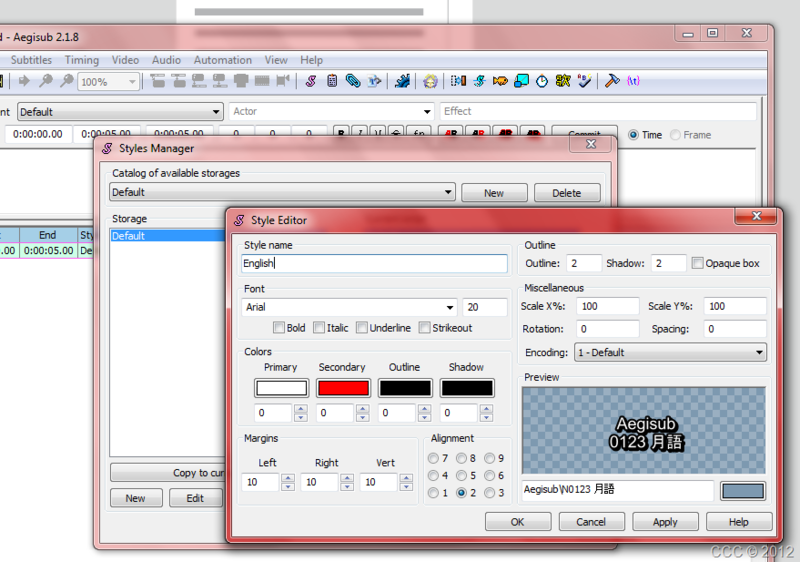 For Minilyrics, Subtitle Workshop, Aegisub, and VirtualDub, you just install them as usual. 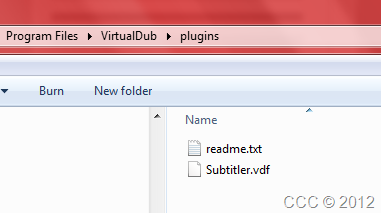 For the filter though, you must copy the Subtitler.vdf from the zip file to Plugin folder in VirtualDub folder in Program File. Very easy, just put the lyric, singalong while your index finger pressing F7 in each line. After you finish, don’t forget to save the file. It’s easier to make it as <name>.lrc. 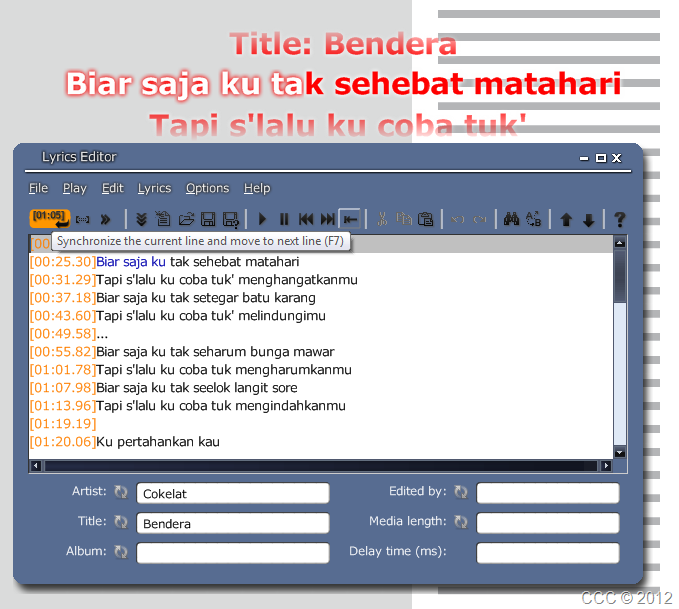 After you finish, you can open the lrc file in Subtitle Workshop to change it to .ssa. Just load the file and Save as SubStation Alpha (SSA). If you want to forgo Minilyrics altogether, you can use Subtitle Workshop, just insert every line, for each line, press Alt+C (Set Start Time), and in the end press Alt+V (Set End Time). 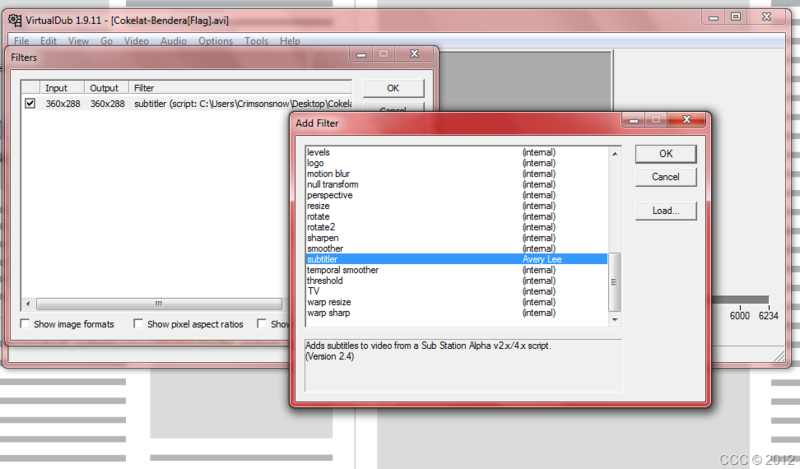 If you already finish, save as SubStation Alpha (SSA). I assume that you already have your timing as correct as possible. The next step is formatting the sub. Because I want the video to have two subs, the Indonesian and the English, with English subtitle placed on top of the Indonesian and having black colour instead of white, I make two kinds of script, Default (for Indonesian) and English (for English). To change the format, just go to the Menu Bar, Subtitles>Style Manager, create New Storage, and Edit. If you only want to make it as softsub (without putting the sub inside a container such as mkv), your work stop here. Just change the sub filename to be the same as the video file. If you want to put it inside a container, I’m so sorry you must go to another tutorial. -Video>FIlter. Add, subtitler, OK. Choose the .ssa sub, OK (or Preview). Save as AVI. Note that you will have a very big file (because you don’t compress the audio). If you want to make it smaller, just convert it in a video converter. You can preview the result in your video player. Happy subbing! Posted on February 8, 2012, in Learning, Making, Plugging and tagged aegisub, bahasaindonesiato, download, hardsub, project, softsub, software, ssa, tutorial, virtual dub. Bookmark the permalink. Leave a comment.